The Pink Moon: the full moon in April. Today is a bright, sunny, crisp day: the calm after yesterday’s storm. Yesterday, by contrast, was a deluge. I got drenched when I ran outside for the school run and errands. Pink cherry blossom petals roiled in the overfilled street gutters, rushing down the street and into the drains. By the evening the sky had cleared and it was cold — winter cold.I could see the glowing sky above our house, and just glimpse the moon over our eaves. I intended to sneak out to look at it, but the warmth of bed beckoned after a long day. So this scene is something I imagined. The cherry tree stands at the gate to Richmond Park in London. I see it almost daily… but I have never seen by the glowing light of the full moon. Maybe someday I will. One of the reasons why I’m painting full moons this year is because I want to connect to the natural world in a regular way. Our ancestors relied on the moon and the stars for so many things. Even my Canadian grandmother lived by the rule that one should never plant your veggie patch until after the full moon in June. In our modern life do we think about the moon at all? Or the stars? We mostly rely on the glowing screens of our phones and computers instead of the glowing moon and stars. The one thing I’ve learned from observing the moon is that the seasons change. I’ve been through lots of seasons of growth, from feeling stuck, to grief, to excitement and rest. They never last forever, and there’s beauty in that. What kind of season are you walking through right now? Tell me below, and I’ll pop over to your feed to continue the discussion! Happy Friday friends! I’m sitting in my studio, surrounded by piles of illustrations which I’m scanning into my computer to be edited before I send them off to the publisher. Rain is sliding down the window-panes. There’s nothing like a grey, rainy day to focus the mind on what is essential. As the fog rolls in, visibility reduces, and I find it easier to concentrate on the things right in front of me. There is only foreground, and no distracting background. Lists abound. Lists of things I need to remember while I’m editing my illustrations in photoshop. Lists of things I still need to do (so many!). And lists of other more mundane chores: items to pick up from the grocery store, new words Mary has invented, and household tasks that need completing soon. What are you making lists of today? Hopefully you also have a list of fun things to do this weekend? And, as an aside. My love letter to you goes out by email this afternoon. Make sure you’re on the list to receive it! Today I need to be gentle with myself. How about you? I intended to send out my creativity newsletter today, but it didn’t happen. Along with lots of other tasks, which all sacrificed themselves for the Big Thing that I need to get done. And you know what? That’s ok! I promise I’ll send out the newsletter tomorrow. We’ll be meditating on being gentle with ourselves (appropriate, huh?). If you want to get in on the conversation, and snag yourself this gorgeous printable bookmark, then sign up below. You still have time. Isn’t that great? My being late gives you more grace time to get on the list. Sending love and gentleness your way from my messy studio. Let's be gentle with ourselves! My other little whirlwind is napping, and then we’re going to bake banana muffins for our playgroup tomorrow morning. And maybe spend some time smelling the cherry blossoms down the road, and chasing the petals as they float to the ground. There are perks to working from home: being able to set my own hours, spending lots of time with my daughter, and making coffee and stepping out into my garden whenever I want. But it’s not always glamorous. Being able to set my own hours sometimes means I work too much. When work is at home, how does one set boundaries? These are things I contemplate as I rush towards illustration deadlines, and also try to slow down time with my daughter. It’s the endless push and pull of chronos and kairos: time that is fast, and time that is slow. How are you starting your week today? Progress, not perfection. That’s my motto at the moment. Does that resonate with you, too? 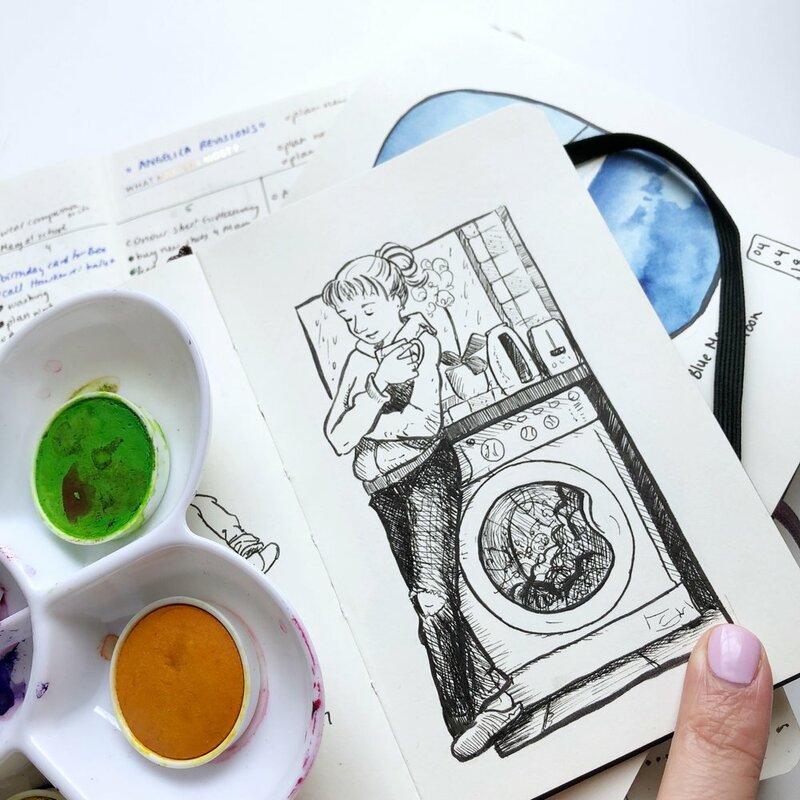 Are you also juggling a million tasks, and sifting through a gallon of priorities? How do we even start? This is how I started today: this morning I lay all the illustrations for one children’s book on my desk like stiff, white quilt squares and started painting them assembly-line style. I mixed my colours (cobalt green, opera rose and indianthrene blue) and lay the colour in washes on each illustration, one at a time. Slowly the layers built up and the squares of paper transformed from white to multi-coloured. This is an efficient way of painting. Quick even. But not easy. It means pulling the images apart in my mind so that I’m not painting people and characters and emotions, but fields of colour. The emotions will come at the end when I add the final details. So, I repeat, “progress not perfection” to myself as I work. The perfection will come at then end. Right now, progress is the most important. What are you working on? How could you simplify it? Make it easier and more effortless? Would making progress of any sort give you a confidence boost? Can I give you permission to start today, just start and do anything so that you’re toes are wet? I promise the water is nice, once you dive in! Watching my daughter grow up is like watching the progress of a magic spell. From one day to the next there is a new light behind her eyes, a new imaginative idea, and a deeper comprehension of the world around her. Her favourite thing to do right now is put on a lace and chiffon dress-up dress and dance around the room to the tinny twinkling of her plastic music player. She transforms from a leggy three-year old girl into a Renaissance Italian princess, bedecked in brocade, lace and silk. Her tiny leather ballet shoes peek out from the bottom of the dress. She takes deep, swaying steps, then rises on tip-toes and holds the long layers of her chiffon skirt delicately between her fingers. Then she turns slowly and does her “balancés” to the other side. When did she grow up? How did she know how to carry her head and her shoulders like a princess, as if she were born to it? And, what will she be tomorrow? Where will this magic spell take us? So, here I am, wearing my Dad’s old hoodie, and my comfiest jeans. My hands are covered in ink. This is my studio uniform. The hoodie is the one my Dad wore whenever he was working at his desk: sorting through invoices, or planning the next season’s farm equipment sales. When he really needed to focus, he’d drape the hood over his head to cut out distraction, and now I do the same. When I wear this hoodie, I feel connected to him. If you came for coffee I’d ask what your plans for the weekend are. Anything fun? I’m probably going to spend early mornings working, so that I can stay on track with my deadlines. Then spend the rest of the time having fun with my husband and daughter. Tell me… how to do you like your coffee? What are your plans for the weekend? 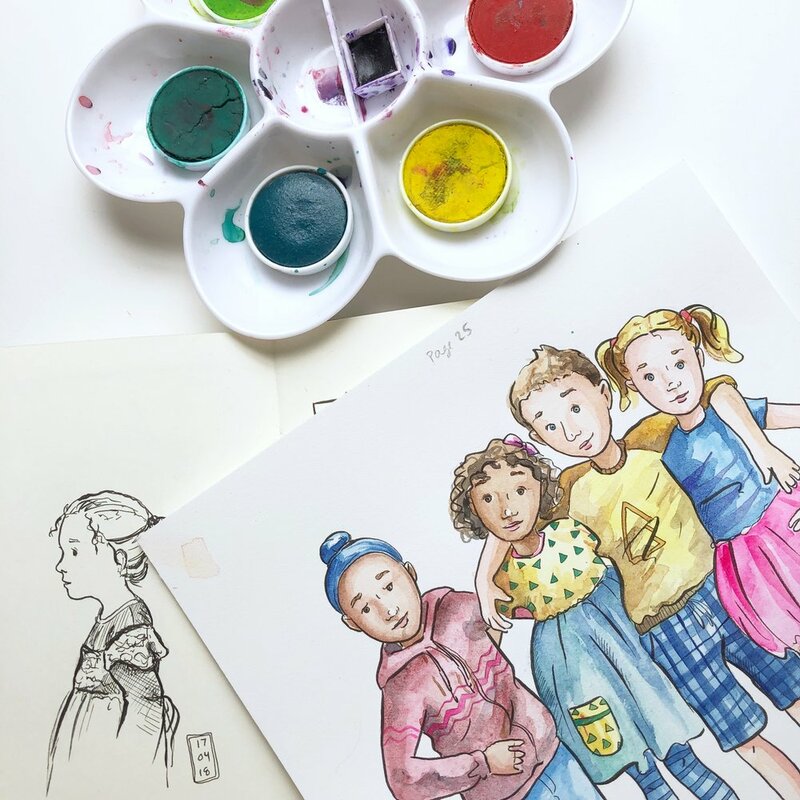 Most days you can find me hunched over my studio table, pen flying across the page, trying to finish the art for three children’s books before the end of May. 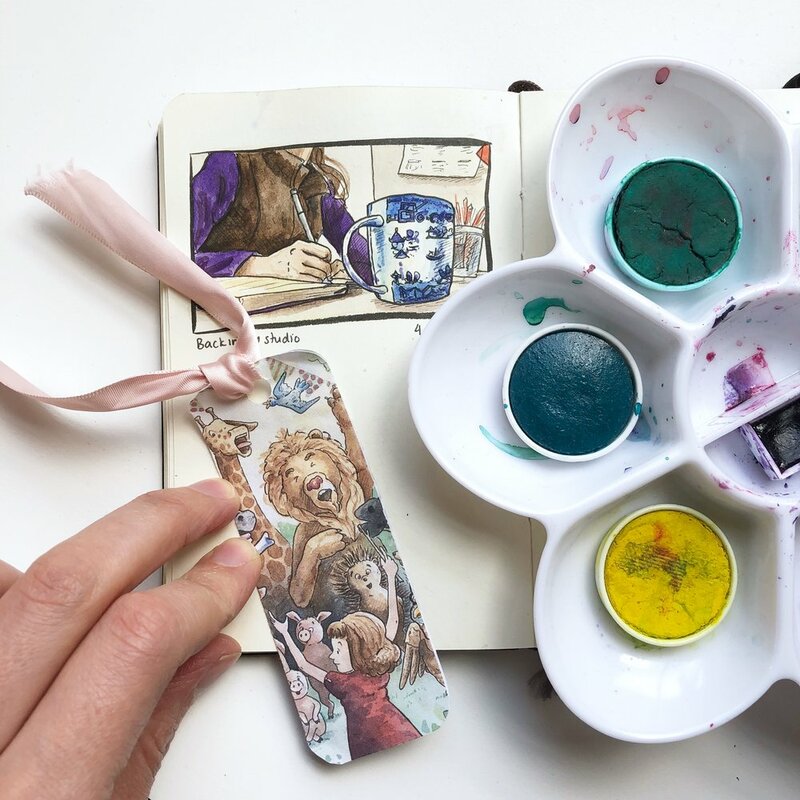 Colourful papers are scattered everywhere like flower petals falling from a tree: reference sketches spread on the floor so I can see them at a glance, working sketches and final art layered on my table in a careful sedimentary arrangement. The most recent and most urgent work is on the top. My laptop is open and humming, so that I can search for reference material at a moment’s notice. My favourite kuretake brush pens are never far from my side, and several can often can be found wound into my messy bun, or tucked behind my ears for safe keeping. Time of of the essence, and my mess, rather than chaotic, is actually a sign of efficiency. Every day after lunch Mary and I sit together and watch some of her favourite cartoons before we cuddle down for a nap. We sit on her “reading cushion” on the floor. She folds herself onto my lap and stretches her legs along mine. Every day she measures them, and stretches her toes as far as they can go. “Mommy, I’m growing. My legs are almost as long as yours are! She grows and changes so fast. I try to hang on to these little moments and sweet memories. Recording them in my sketchbook is a way to stop time from spinning forwards too fast. Don’t forget, dear friend, that you still can enter to win a signed and doodled-in copy of my newest book. Just check out the link on the post below this. You don’t want to miss this chance! She’s loving, loyal and creative. She gives her clothes to charity. She collects books. When she sees someone who needs help, she always has a minute to stop. She’s a character in the newest children’s picture book I illustrated called “On Our Street,” which is a compassionate look at poverty and homelessness for young children. It approaches the tricky issues as a conversation between and adult and a child, and offers simple ways for even the youngest children to help. It is an incredible and inspiring resource, and I’m certainly looking through it with my three-year old daughter. It is written by Dr. Jillian Roberts, child psychologist extraordinaire, and Jaime Casap, Google’s Chief Education Evangelist. For my daily drawing, I decided to doodle Lily on the title-page of the book with my Japanese brush pens. But I can’t keep Lily to myself. I’d love you to have her! To win a copy just head over to this link! The grand prize is the doodle-in and signed copy plus an exclusive greeting card and sticker pack. Five more North American winners will win copies of the book sent out by Orca Books. All are eligible to enter this giveaway! It might be your lucky day! We are slowly reentering our routines. The washing machine is humming in the kitchen directly below my studio. I’ve hung clean laundry on the drying rack in a sunny patch of our garden for the first time this year. Is summer really on it’s way? My hands cradle a warm cup of coffee and my pens and pencils are spread in an array of rainbows across my desk. This seems like such a serene moment. But, in reality I have three children’s books to finish before the beginning of June, and I’m not sure how I’m going to do it, considering life’s constantly complicated balancing act. So, I’m focusing on the first steps instead of the whole journey. I’m making edits to my sketches that are due next week. I’m creating a shopping list for art supplies (I’ll need a lot of paper, and fresh pens). And I’m writing lists upon lists: some are realistic and achievable, and some are super-optimistic and coated with fairy-dust. I’m hoping I can achieve the first, and if I’m lucky, a little fairy dust might land on me, and I’ll be able to achieve the second, too! In this moment: hanging laundry, sipping coffee, making lists, and modifying sketches. P.S. The address on the bottom of my fantastic mailing list is: the studio above the kitchen. Sign up on my home page and get a few sneak peaks! Hello Friends! I’m back in the studio and remembering our three-week trip to South Africa fondly. 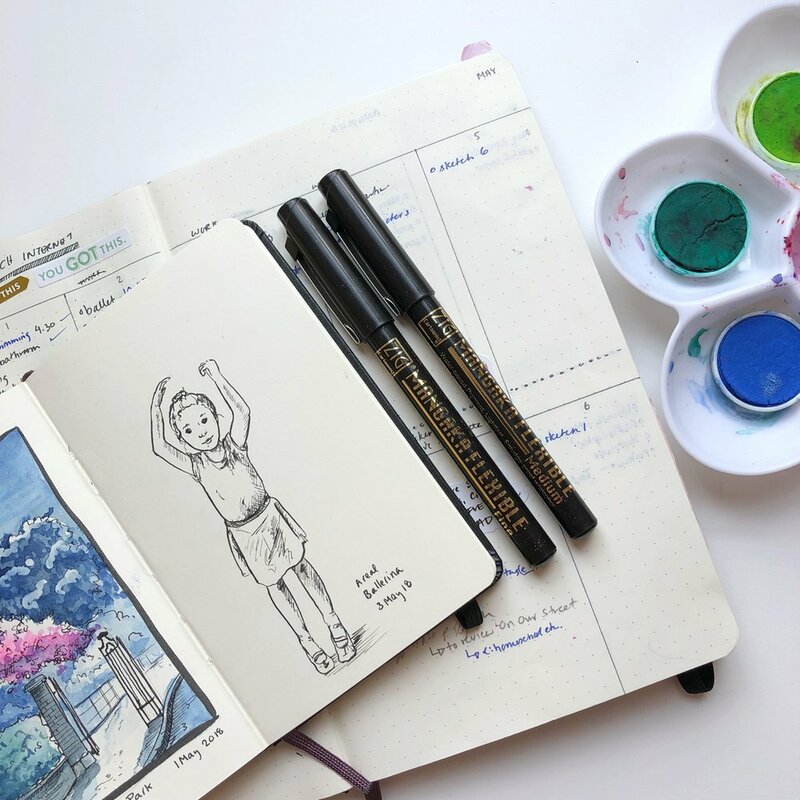 I had intended to post daily drawings of our holiday in Cape Town and Johannesburg, but when we arrived and started to relax, I honestly had no inclination to draw. That’s ok isn’t it? I left my sketchbooks, pencils and paints unpacked in my suitcase, and I never looked at them once. Here are two little memories before I resume my usual studio hours in London. I loved waking up to the rose dawn light painting the reverse side of Table Mountain pink. It was the view from our bedroom window, and I couldn’t wait to draw the blinds to see the new colours each day. (Even if it was at 5am, with our little one’s early wake-ups). And, in my quest to paint all the full-moons of 2018, here is the Easter moon, as seen from the wing tip of our flight from Johannesburg back to London. Now my lists are made, my schedules are drawn up, and deadlines are fast approaching. I can’t wait to get started on it all. Plus, I’ll be hosting another giveaway next week, so stay tuned! Hello! I thought I’d introduce myself. I’m a children’s book illustrator, and when I’m not busy working in the closet-sized studio in my house, I’m playing with my three-year old daughter. 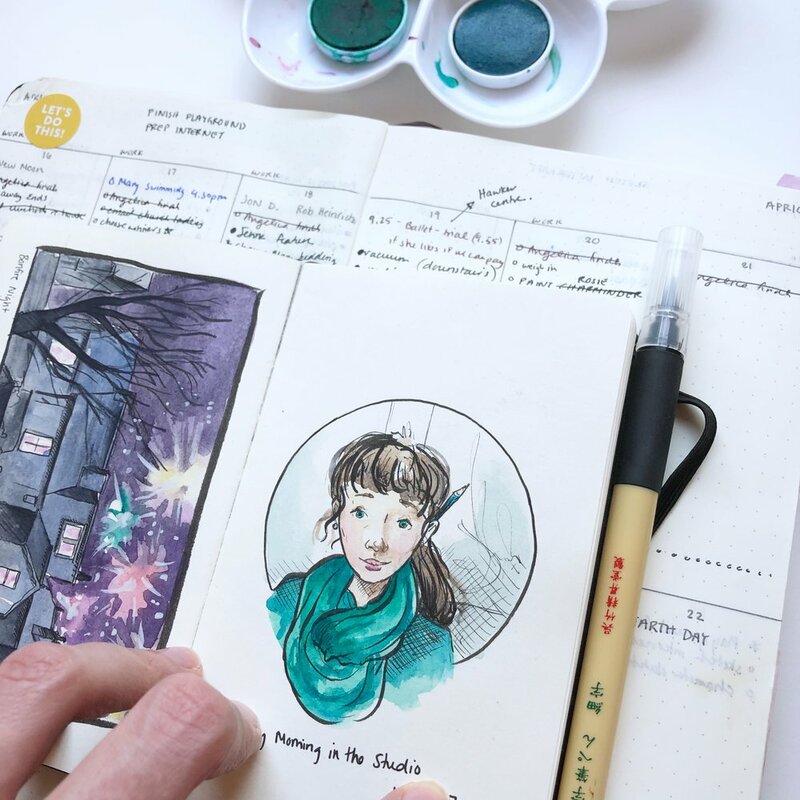 I do daily sketches in my tiny moleskine sketchbook. It is a way to warm up my fingers, like a pianist playing scales, before I start with my “real” work. I love these daily sketches, and even when I have a hard day, when I can get nothing else done, the fact that I’ve taken 15 minutes to draw in my sketchbook, post it here , and connect with all you lovely friends, gives me so much joy. I also love sipping decaf lattes. Reading anything and everything. And writing in my journal. A few more random facts: I grew up in Canada but now live in suburban London (Kingston Upon Thames), my husband is South African and we love visiting Cape Town, my daughter was due on Guy Fawkes day (fireworks night) and, but she arrived early. Are you curious about anything? Ask me a few questions and I’ll answer them in a FAQ post soon. March 1st was also World Book Day! There’s so much to celebrate today! 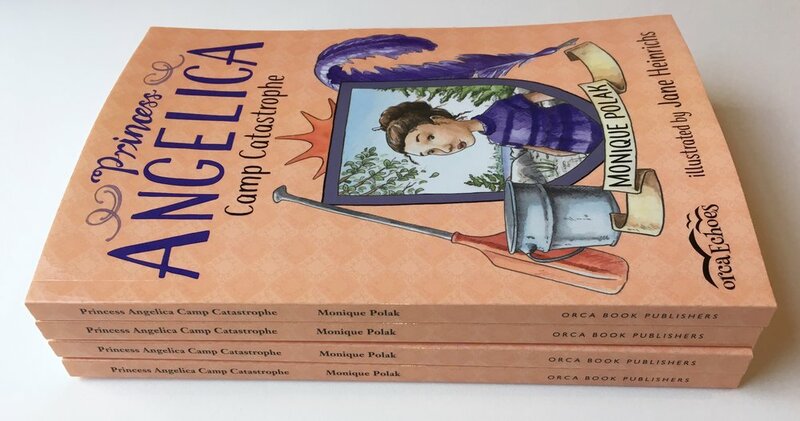 I had two children’s books launch already this year: Princess Angelica and On Our Street. And another one is coming in October. I’m running a give-away to celebrate World Book Day and the magic of reading. I’m giving away a signed and “doodled-in” copy of Princess Angelica with a greeting card and sticker bundle from my online shop. It’s written by the incomparable Monique Polak. And Orca Books is adding in 5 more for five more lucky winners. This is the first snow she will remember. I loved watching her marvel at the trail of footprints she made on the quiet street; the cars layered with snow like iced cakes. The outside world was silenced by the deep, downy duvet covering our neighbourhood. Time stood still in that moment, and we watched the ice crystals fall from the sky and they landed on our noses and eye lashes. These little moments mean so much to her. I try to remember this every day. But sometimes it takes something extraordinary, like a blizzard in London, to get me to slow down and savour the moment. What can you do today to remind yourself to live in the moment?